Today's Almond Butter Chocolates from Phi Kind (Santa Rosa, CA) were sweetened with Non-GMO birch xylitol and sunchoke syrup instead of sugar. And for sugar-free chocolates, these were not too sweet (thank you Jonathan!) yet naturally flavorful and satisfying. A well-balanced, dark chocolate with a slight bittersweet coffee and nut flavor note these rectangular chocolate covered pieces were enjoyable without the usual sugar buzz (again, thank you!). 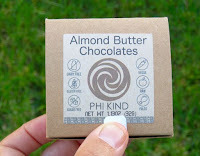 These chocolates (made nib-to-confection with Ecuador cacao) were dairy free, gluten free, sugar free, vegan, raw, and paleo.